Castello di Reschio in Umbria. 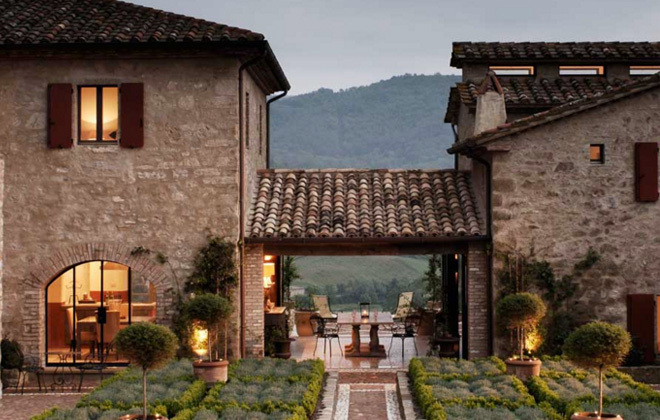 Nestled in the rolling hills of the history Umbria region in Italy, Castello di Reschio is one of those places that just seems too good to be true. That’s why I just had to see it. I was lucky enough to do so on my vacation to this magical region this past July and I am sure to find myself dreaming of a return visit in the near future. Everything about Umbria is magical! One of the breathtakingly beautiful houses on the Reschio Estate. The recently restored estate has a long history, with structures dating back to the 14th century. It served as a fort, a farm, and a countryside retreat for Italy’s finest, until the late 20th century when it fell into disrepair. The estate was then bought in 1994 by Count Antonio Bolza and his family, who began a decade long restoration and renovation of the land and the structures, which include the main house, guest houses, a large tobacco barn, along with vineyards, orchards, and stables for their thoroughbred horses! I just love this detail of stone work being restored on the premises. But what drew me to Reschio is its amazing art and design program. The estate is now run mostly by Anotnio’s son, Benedikt Bolza, who is also a London-trained, award winning architect, and implemented a design workshop, and an artist exhibition space on the grounds in order to revive the centuries old artisan tradition of the region. A detail of an artisan at work in the workshop. The Tabaccia, which is a beautiful 1940s tobacco processing center was restored as the Creative Center in 2014. Benedikt restored the building, keeping its utilitarian style, while updating it with essential modern workspace. It now functions an exhibition space for art works and artisan made goods from the region and around the world, with proceeds going to non-profits around the region. Benedikt also has his own workshop for local artisan made lighting and furniture. Here, a team of locally trained craftsmen fabricate Bolza’s own modern designs, along with other lighting and furniture, all made onsite from materials sourced from the region. I love the fresh, modern design of this kitchen. And last but definitely not least… this view! ***So there you go. I am already dreaming about revisiting now that I wrote this article. Guess that didn’t take long.